A land and estate agent has supported an unusual local art project – by donating hundreds of used tea bags to the cause. Staff from Bell Ingram’s Perth office have been brewing up double their regular amount of daily cuppas to contribute to the construction of an imaginative, six foot tall angel sculpture, made entirely of recycled, dried tea bags. Dunblane resident, Sue Horne, is the person behind the unique creation and collected well over 3,000 tea bags in a wide variety of shapes and colours as the distinctive ‘fabric’ for the sculpture. The out of the ordinary community project is also backed by world-renowned classical Syrian guitarist Ayman Jarjour and ultimately aims to raise funds for Syrian refugees. Sue said: “I wanted to create something that was fun and a little bit different, but that would also relay a meaningful community message. “Tea is a cross-cultural, classless drink which is often used to bring people together and make others feel welcome. It represents a feeling of homeliness and comfort, and this is the expression of warmth that our community will pass on to those from Syria. “I’m very grateful to Bell Ingram and everyone else who got behind the project and donated their used teabags. It was fantastic to see people coming up with their own unique ways of drying them too – from putting them on the radiator to even ironing them! Victoria McCusker, Marketing Manager at Bell Ingram, said: “We contributed all our used office tea bags to this project as it really captured our imagination. We love the fact that not only is it raising funds for Syrian refugees, but also raising awareness of our role as individuals in welcoming displaced people into our communities. 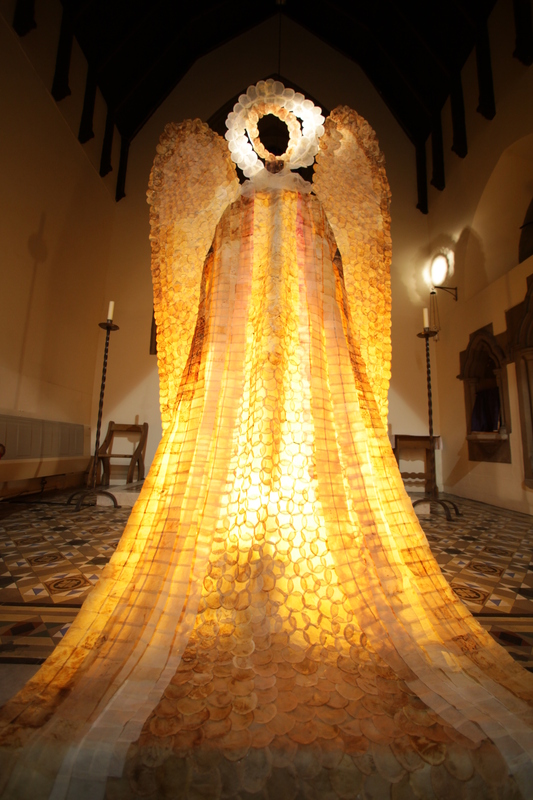 The final Tea Angel sculpture was unveiled on Sunday 13th December during morning worship at St Saviour’s Church on Fountain Road in Bridge of Allan, and was on display at the church until Friday 18th. Bell Ingram is one of numerous businesses which has donated its used tea bags, with a total of over 3,000 collected so far and many still being donated to the creative project from all across the UK. To follow progress, please visit The Tea Angel Project’s Facebook page. Established 116 years ago, Bell Ingram has 130 professional staff across 11 UK offices, including chartered surveyors, estate and forestry managers, architects, planners, building surveyors, tourism and green energy specialists. Got a unique story you are keen to tell?